We’re breaking out the eggnog! No other drink reminds of the holidays quite like eggnog. I have to actively remind myself to not drink the whole carton. John is a fan too. My kids aren’t though. They used to call it “yellow milk”. Maybe eggnog is an acquired taste? Anyways, I think it tastes delicious! This year, I made it my mission to do more than just drink our eggnog. I wanted to use it in some recipes and share them with you. Since I’m the queen of breakfast casseroles these past couple months, I figured I’d whip up an Eggnog Breakfast Casserole. I used eggnog in place of the milk/cream. Boy, am I glad I did. This may very well be the best breakfast casserole EVER. For the bread layer, I used croissants. I love the buttery flavour they add to a breakfast casserole. Plus they bake up really nicely in the oven. I used a small casserole dish since only John and I like eggnog in our home. If you use a 9×13 dish, just double the recipe and it should work fine. We always sprinkle nutmeg on top of our eggnog so I had to make sure it was included. It’s mixed in with the eggs and eggnog. For the topping, I sprinkled on brown sugar and cinnamon. It bakes into a sweet, crispy crust. Beneath that is the creamy eggnog custard and croissants. If you wanted to add maple syrup you can. Fresh berries also work. I thought it tasted fine on its own and it didn’t need any extras. Consider this recipe for Christmas morning! I might just make for John and I and then do another type for my kids to eat. Maybe they’ll like eggnog when they are older? You never know. I was a veggie hater till my early 20s. Meet your holiday breakfast! 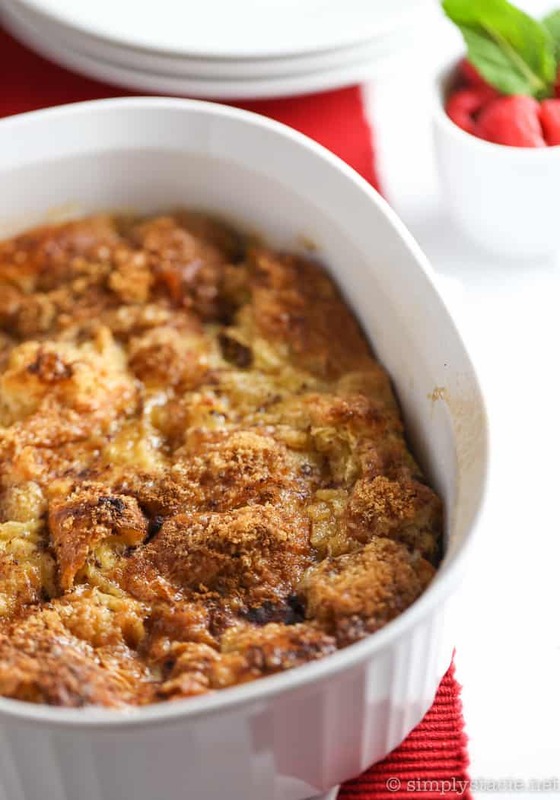 This Eggnog Breakfast Casserole is absolute perfection. Spray a small casserole dish with cooking spray. I used this CorningWare casserole dish in this recipe. Spread croissants on the bottom of the dish. Set aside. In a medium size bowl, whisk together eggs, eggnog, vanilla, cinnamon, nutmeg and salt. Pour over the croissants. Sprinkle brown sugar and cinnamon on top. Bake, uncovered, in a 350F preheated oven for 25 to 30 minutes, or until top is golden brown. Serve hot. 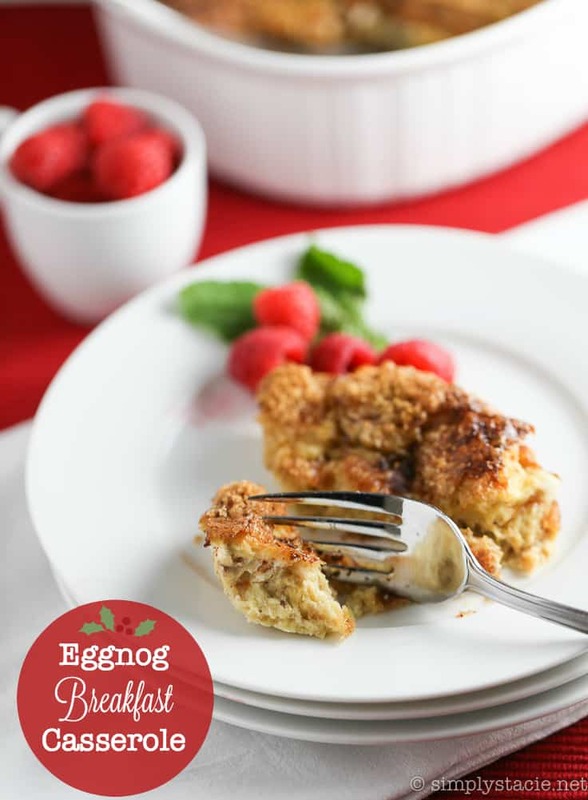 I am not a big fan of Eggnog but my hubby loves it, I might just have to make this casserole for him. Thanks for the recipe! This is a very creative way to use eggnog! I love Eggnog and use it in my coffee as a creamer. It tastes so good and I have some every year for the Holidays. I like your eggnog breakfast casserole and I want to make it. It looks so delicious! I love eggnog. What a great idea for making use of its flavour! I love eggnog, and this casserole is special! It would be perfect to bring to a special breakfast get together! I love EGGNOG, already bought two litres this year. I love eggnog so I can’t wait to try this, it’s the perfect size since my hubby doesn’t like eggnog, so I can share with my granddaughter, mmmmmm!!!! I have never used eggnog to bake a treat like this! This looks yummy! I’m going to make this for my family Christmas brunch. Can I prepare the night before and refrigerate? No way! I’m pinning this…. This looks delicious. But i’m confused about the croissant part. Are they already made? Or do they bake with the casserole? They are already made. You can buy the store bought ones or use homemade ones. I usually buy them already made at the bakery. I’m not really a fan of eggnog. But I think this would be a great way to “hide” it, yet still indulge. But of course I’m not letting this stop me from my mimosas 🙂 Thanks for sharing! Oh that sounds fantastic. We are big fans of eggnog at our house. We are always looking for breakfast casseroles to pin and make. This looks like fabulous for a holiday breakfast! Oh I love eggnog. I am the only one in our whole big family but I am not too proud to drink it anyway. I bought a small container at the store yesterday and have already started on it. I will be careful and not drink too much!! Your casserole looks great. Sounds decadent and delicious! Thanks for sharing! I usually make a sausage casserole each year buy think I’ll give yours a try! I found your blog from Zevy Joy! Oh my goodness, this is what my dreams are made of. Eggnog and croissants?! Yes, please. Wow! I love eggnog so this looks delicious! Sounds & looks yummy! Thanks for sharing at the Inspiration Spotlight Party. Pinned & shared. 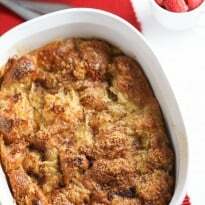 Your Eggnog Breakfast Casserole looks delicious and it will be featured this week on Full Plate Thursday. Hope you have a great week and come back soon! What a great idea. I’m like you, trying not to drink the whole carton of eggnog. 🙂 Enjoy your weekend. Even though I am a little late, there is always room for more. I am trying this special recipe out. 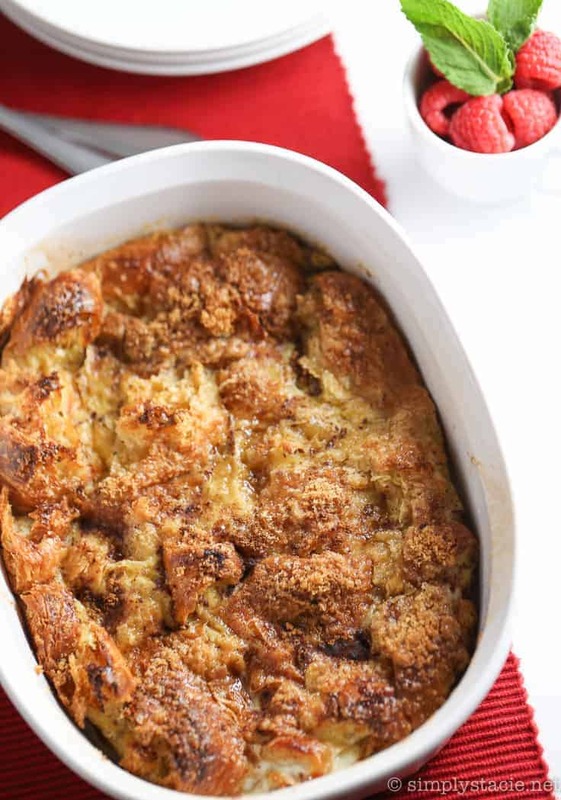 Eggnog Breakfast Casserole looks really delicious,i don’t like eggnog but hubby loves it! 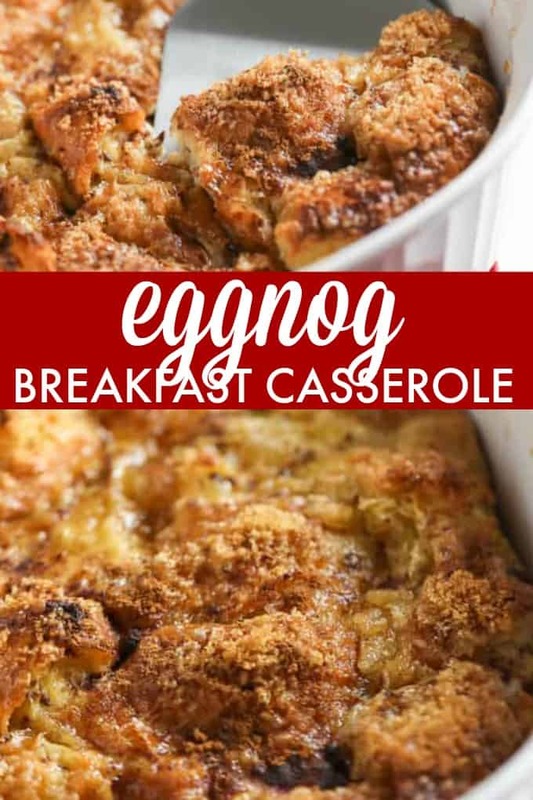 Thanks for sharing it looks delicious,i would never have thought of using eggnog in a breakfast casserole.